I married at 22 years old in a big Catholic Church wedding and became pregnant within four months. When Jeff and I divorced five years later, I was ready to do something radical. I enrolled in a ten-week yoga course. Even though yoga was considered an activity mainly for fringe dwellers, the physical style I was doing seemed tame enough. When I eventually came to live in Australia, I continued to participate in yoga. I found my way to Iyengar Yoga classes and loved the physicality of this method. So much so that I did yoga teacher training and became qualified as an Iyengar teacher. It took me years to learn and accept that there were benefits in doing what I thought of as the more esoteric practices. I gradually added Yoga Nidra, Pratyahara, meditation and Pranayama to my repertoire of practices. When I was nursing injuries or recovering from surgeries and illnesses, these practices were invaluable healing aids. Now, I’m about to add another string for my teaching bow by learning and practising something relatively new to me: Mudras. I’m very pleased to announce a return visit to the Yoga Shed by Rachel Zinman, my friend and yoga colleague. She will be leading a workshop on Mudras on September 1st (Saturday) 2-5pm. 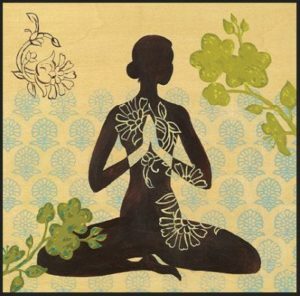 Mudras bring together mind, intention and energy to invoke a feeling of stillness and contentment. Mudras are a combination of subtle physical movements which alter mood, attitude and perception to deepen awareness and concentration. The inverted restorative pose, Viparita Karani, or legs up the wall, is also described as a Mudra. It’s an excellent preparation for meditation. And, San Mukhi Mudra also serves to prepare us for meditation as it encourages Pratyahara (control of senses). Rachel’s workshop will be practical as well as theoretical in that we will be learning a flowing gesture sequence. Her session will include asana, pranayama and mantra, too. To make Rachel’s visit even more special, there is the option of staying for supper after the workshop and enjoying the music of Kirtan. I’ve experienced the devotional music that Rachel and her husband, John Weddepohl, play, and it’s wonderful–not to be missed! The workshop is open to all levels of students. I hope you will join us September 1st, a day which also marks new beginnings–the first day of Spring.